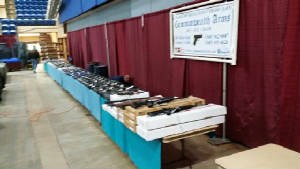 Commonwealth Arms has been setting up at Virginia gun shows since October of 1999. A lot of folks may wonder why we go through the trouble of boxing up all of these guns, putting them in totes, loading them in a trailer, and then setting them up at a show with many other vendors. Simple, we sell a LOT of guns at a gun show, even on a slow weekend we can sell 45 guns, and have sold over 100. We simply cannot do that kind of volume in two days at the shop. We typically work about 10 shows a year, resulting in the sale of at least 600 guns that we would not sell if we did not attend. Over the years we have learned a lot of things about these shows. One of them is how ill prepared a lot of folks are to purchase fireamrs at gun shows, and their lack of understanding of the law. Most of this is not their fault really, most of the information they get comes from the meda. And the media does not know a damn thing about gun shows. The purpose of this guide is to help folks planning on attending a gun show get the most of their experience. And while you are there, check us out. Odds are we may have what you are looking for at a very reasonable price. What is the procedure for buying a firearm at a Virginia gun show? From a licensed dealer it is the same as if you were in a gun shop. The media would have you believe that gun shows are shady places where folks walk around in a dimly lit building a sell guns with no questions asked. Nothing could be further from the truth. The majority of firearms vendors set up at gun shows are legitimate business with Federal Firearms Licenses. If you are a Virginia resident you will only need to provide your Drivers License or DMV issued ID card, as of July 1, 2017 you no longer need to show two forms of identification. Non residents however, still need to provide a second form of ID. After providing your identification you will need to fill out the federal form 4473, and the Virginia form SP-65, just like you do at a gun shop. After completion of the paperwork we will run the criminal background check onsite via laptop computer. Yeah, only the old timey deer gun dealers living in the past still call them in, so you won't have to wait while we're on hold for a half hour. If you get an instant approval, then you pay, we shake your hand, and you take the gun home with you. The whole process took maybe 10 minutes. And if you delay, do not worry. Virginia now prioritizes gun show sales on weekends so typicall delays are processed in less than an hour. All normal laws concerning buying a firearm that apply in a ship apply at a gun show. For example, you may only buy a handgun in your state of residence. O.K, so that is how it works with a dealer, but what about private sales? Isn't it legal for me to sell a gun I brought in to another indivdual? Yes it most certainly is, but there are rules here too. And these rules are the law. In Virginia it is lawful for an indivdual to transfer a firearm to another individual privately provided that the following criterea is met. What that means is those "no questions asked" sales that the media talks about are ilegal. Folks this is nothing new, this has been the law since 1968. Last year a guy was attending a Salem show and a gentlman asked about a gun he was selling. The man quoted a price "no questions asked" The other man agreed to the price then as soon as the transaction took place showed his badge. Now this gentlman is charged with a felony, because he did not simply ask to see ID. Folks, they are cracking down on this. "No questions asked" does not work. You need to be smart when selling, buying, or trading privately. Also be cautious of guns on the floor that are too cheap. Somebody could be trying to dump a stolen gun. O.K, that makes since, but what about these guys selling from a table that don't require paperwork, is that legal? Only if they are selling a private collection. Federal law states that in order to be engaged in the firearms business a seller must hold a Federal Firearms License or FFL. Engaged in the business is defined as buying, selling, or trading firearms with the intent on making a profit. Therefore the "unlicensed dealers" that the media talk about do not exist. Someone buying and selling for pofit without an FFL is already breaking the law. Yes, there are folks that do this, we see it at all the shows. But in time, they will get caught. Always ask if a private seller with a table is selling a collection, you do not want to get caught in the middle of a transaction with someone emulating a dealer, you could be charged in additon to the seller. We are not trying to discourage private sales, only trying to educate everyone on what is legal and what is not. I have a Curio and Relics FFL, will gun show dealers transfer a C&R elgible firearm to me without doing the 4473, etc? Commonwealth Arms will. All you will need to do is provide us with a copy of your license and we will gladly transfer any C&R firearm to you. We will also provide you with a copy of our FFL for you to have on file, and to use when you log your firearm in your C&R bound book. Other than that some dealers will, some will not. We have personally witnessed one dealer absolutely refuse to honor a C&R license on a clearly C&R firearm. There is no legal basis for this, but be aware that for whatever reason some dealers will not honor a C&R FFL. Is it legal for me to carry a conceled handgun in a gun show? Only if it is unloaded. The gun show promoters strictly enforce a no loaded guns in the show policy. That is why all of the guns for sale either on tables, or the floor are zip tied. If you are caught with a loaded gun in the show you will be escorted out, and banned from all future shows. That is the rule at all Virginia gun shows. We hope this information will help you when you attend a Virginia gun show. Next time you are at Roanoke or Salem come by and say hi. We'll be glad to answer an questions for you.